He sells T-shirts, not cupcakes... but it's happening at Georgetown Cupcakes... got that? The T-shirt designed known as Johnny Cupcakes is swinging by Georgetown Cupcake (3301 M St. N.W.) to meet up with fans and offer six "suitcase exclusive" T-shirts and a few other specials on Friday, May 8. He started up selling T-shirts out of his beat-up Toyota Camry. Now he's got three stores and a cult following, but he's decided to go back to basics and hit the road at venues across the country at "neat businesses that I respect," he says on his website " -- art galleries, boutiques, bakeries, toy shops, and many others." The most famous design? 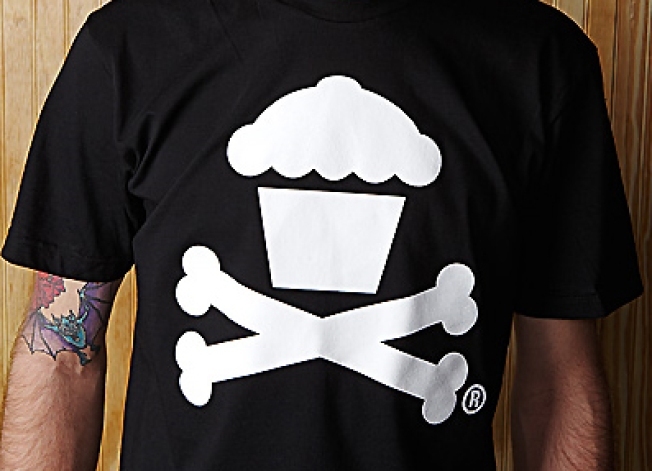 The now-iconic "cupcakes and crossbones," which has translated into everything from a too-cute cartoon character to the ominous "slasher" shirt. Word has it that folks are already starting to line up on M Street for this evening's event, which kicks off at 8 p.m. Go, grab a spot and nosh a cupcake while you wait.